There was another organized protest by commercial salmon trollers in Sitka — this time directed at Sen. Lisa Murkowski. About 25 fishermen and family members gathered outside of the Westmark Hotel before the senator’s presentation to the Chamber of Commerce, to call for Murkowski to intervene in the Pacific Salmon Treaty. This is the fourth time salmon trollers have taken to the streets during the 2018 season to protest proposed cuts to the chinook harvest in the Pacific Salmon Treaty. 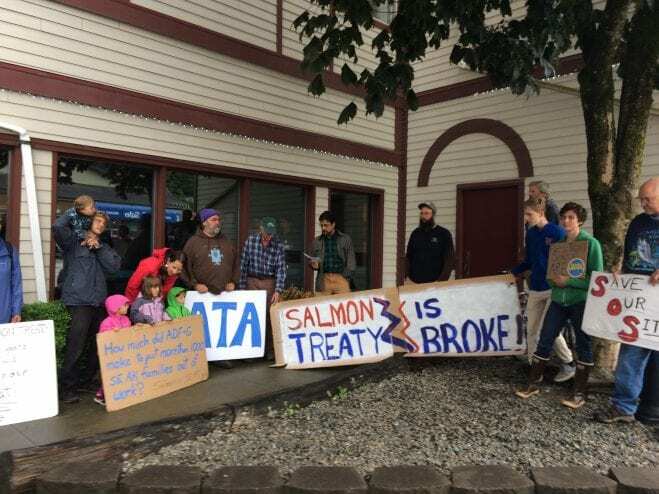 In May, trollers gathered outside Sitka’s Centennial Building prior to the start of a state salmon symposium hosted by ADF&G Commissioner Sam Cotten. When Governor Bill Walker visited Sitka in June, dozens of fishing vessels paraded up and down the harbor, asking that Walker refuse to sign the treaty, if it forced Alaska trollers to trade a share of the king salmon harvest to Canada, to protect endangered stocks in Washington. Trollers then organized a rally in Sitka’s harbor prior to the start of the July 1 opener, where one fisherman symbolically used a flare to burn his boat payments. The treaty is up for renewal this year, and now trollers are focusing their energy on Murkowski. Howard Pendell, former member of the Northern Panel of the Pacific Salmon Commission, said Murkowski has been an ally to the trollers in the past and he hopes she’ll pull through by calling for a federal review of the treaty. Pendell is one of several prominent trollers backing The Chinook Futures Coalition, an advocacy organization headed by Deb Lyons, also a former member of the Northern Panel. The group is unhappy with Deputy Commissioner of Fish & Game Charlie Swanton, Alaska’s lead negotiator with the Pacific Salmon Treaty. Today was the first time the group openly called for Swanton’s removal. Swanton and the Alaska treaty team aren’t without supporters, however. When Lieutenant Governor Byron Mallot visited Sitka in March, he said he believed Swanton and his team would continue to act in the best interest of Alaska during the negotiation process. Murkowski arrived to the chamber luncheon just after the protest finished, but she respond to a question about the treaty process posed by long-time Sitka troller Matt Donahoe. . And while she expressed empathy for those affected by cuts in the salmon harvest, she walked a fine line between using her considerable influence to intervene, and her instincts toward less federal oversight. But Murkowski did not equivocate over funding for the treaty process. She wanted Alaska’s negotiators to have all the research and data support the government could provide, and thought the Trump administration was not on the same page. And as sure as the sun will set and the moon will rise, the Pacific Salmon Treaty will continue to stir passion from within the fishing fleet .